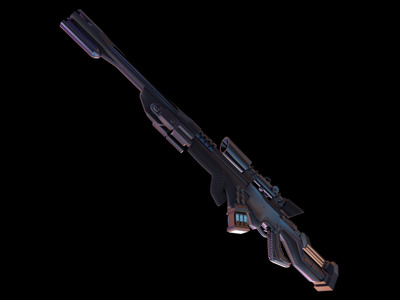 The Nightstinger Blaster Rifle is a highly sought-after, long range sniper weapon that is most often used in Imperial covert operations. Designed by the Xerrol Corporation, the unique looking sniper rifle uses a specialized gas canister to fire invisible bolts of energy. The obvious advantage to this technology is that it can be fired from practically anywhere, including open, public places. By using deflection mirrors and blaster tubes, a sniper can create the illusion of a shot being fired from another specific location. It becomes possible to frame another party with such techniques. The ability to strike invisibly is balanced by some extreme drawbacks. The Nightstinger is considered to be of average firepower, and it also uses incredible amounts of tibanna gas for the invisible bolts. Each canister of gas can only produce three to five shots before depletion. Furthermore, the crystal used to focus and alter the color of the bolt is very expensive and rare, which has caused its field usage to be extremely limited. Last updated on Year 14, Day 27, 13:42:53.